Abdulrazak Namdas, spokesman of the federal house of representatives, says Abdulmumin Jibrin, former chairman of the appropriation committee, made a series of allegations against principal officers of the house because he was relieved of his duty. Jibrin was replaced with Mustapha Dawaki Bala by Yakubu Dogara, the speaker, on Wednesday. 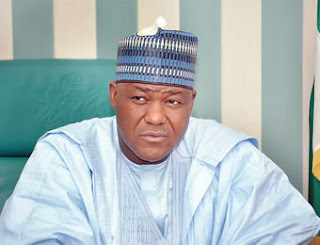 However, on Thursday, he accused some principal officers of the house, including Dogara, of a “unilateral decision to allocate to themselves N40 billion out of the 100 billion allocated to the entire national assembly”. Reacting via a statement, Namdas explained that Jibrin’s removal as chairman was the prerogative of the house selection committee. “We wish to say that it is the prerogative of the Selection Committee of the House to appoint and remove Committee Chairmen. That power has been so exercised in the case of Hon. Abdulmumin Jibrin as chairman of Appropriation Committee,” Namdas said. “If he had all these ‘facts’ before, why didn’t he make them public? Why is he doing that now? “Hon. Abdulmumin Jibrin, like any other member of the House, knows that there are conventions and precedents as it relates to budgets and projects for principal officers of the National Assembly. Why is he making it an issue now? In any case, he is entitled to his opinion as a Nigerian and as a legislator while acting within the laws of Nigeria and rules of the House. He advised Jibrin not to distract the house from giving legislative support to important issues facing the government. “The Nigerian people are simply not ready to waste their time on personal issues and personal egos of our leaders. We should face the urgent tasks before us for which we were elected, “he said.